Dennis Adams worked at Lister Cars and Marcos at different points in his career and also he built a few cars of his own. Perhaps the most famous is the Probe 16, also known as the Durango 95 from A Clockwork Orange. In the 1980s he designed this Jaguar-based Roadster with a very neoclassic-like look. Originally powered by a 2.8-liter engine, this car now boasts a 4.2-liter Jaguar straight-six with three carburettors. Depending on which era the engine came from (it was around a while), this car probably makes somewhere between 168 and 265 horsepower. Top speed is claimed to be over 100 mph. The Adams Roadster was built between 1985 and 1999 and only 17 were ever constructed. The green paint is somewhat striking and the interior looks like it’s definitely been used but still shows nice with no noticeable cracks or tears. This rare Jaguar-powered machine should bring between $25,500-$38,250. Click here for more info and here for more from H&H Classics. 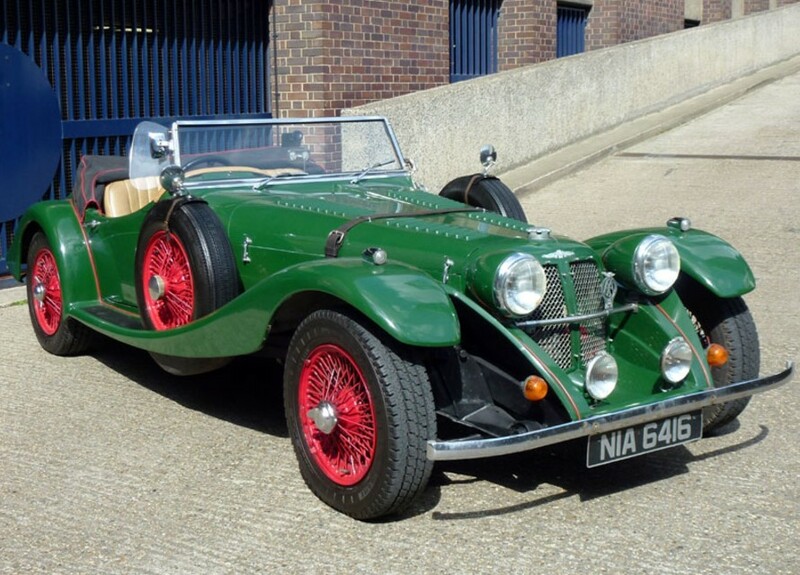 This entry was posted in Uncategorized and tagged 1985, adams, auctions, cars, classic cars, h&h classics, neoclassic, roadster by classiccarweekly. Bookmark the permalink.